i read these words and knew that i needed to recreate this dish. which meant i needed to make tomato jam. i posted this on 17 september. 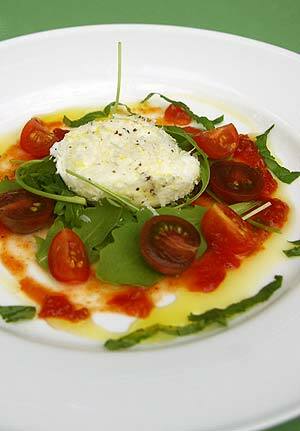 the picture above is the tomato and mozzarella salad i created. tangy tomato jam smeared on the plate so it’s part every mouthful; some beautifully soft and delicate buffalo mozzarella, rolled in a mix of grated parmesan, lemon zest and black pepper; purple and red cherry tomatoes (thanks to david’s colleague david, who grew the purple cherries– what a treat to have proper tasting tomatoes in october!) plus a few peppery rocket leaves, some shredded basil and a drizzle of olive oil. the flavours worked fabulously and i loved this dish. it’s hopeless to have only just found it, as summer departs, but i will be making it again next year. many times. i suggest you bookmark this and do the same!